What is it with Democrats and their terrorist buddies? A gentleman named William Ayers, he was part of the Weather Underground in the 1970s. They bombed the Pentagon, the Capitol and other buildings. He's never apologized for that. And in fact, on 9/11 he was quoted in The New York Times saying, "I don't regret setting bombs; I feel we didn't do enough." An early organizing meeting for your state senate campaign was held at his house, and your campaign has said you are friendly. Can you explain that relationship for the voters, and explain to Democrats why it won't be a problem? Now, for those of us who were not paying attention to politics during the 1970s, a quick recap is in order. The Weather Underground was one of several extreme leftist groups that considered merely protesting the Vietnam War to be too wimpy; a more active approach was called for. 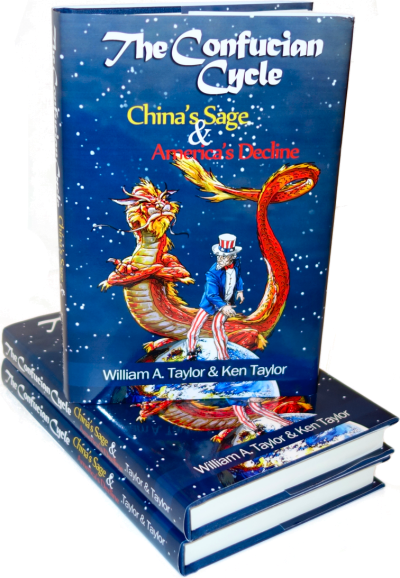 He writes that he participated in the bombings of New York City Police Headquarters in 1970, of the Capitol building in 1971, the Pentagon in 1972. It is only through great good fortune that nobody was killed in these attacks, although his girlfriend at the time blew up herself and two other people while assembling more bombs at home. He benefited from this luck too, though; since his terrorism had no casualties, the law of the day had a very short statute of limitations. He wasn't caught and tried within five years, so has not had to answer for these actions in a court, and never will. In the years since, he married Bernardine Dohrn, an even more notorious terrorist, and became a professor at a Chicago college. When Mr. Obama started his political career, he apparently felt the murderous Mr. Ayers' endorsement was worth pursuing. Ayers held a campaign event for him at his house, and others have reported the men to be "friends." This is a guy who lives in my neighborhood, who's a professor of English in Chicago, who I know and who I have not received some official endorsement from. He's not somebody who I exchange ideas from on a regular basis. And the notion that somehow as a consequence of me knowing somebody who engaged in detestable acts 40 years ago when I was 8 years old, somehow reflects on me and my values, doesn't make much sense. "I don't regret setting bombs," Bill Ayers said. "I feel we didn't do enough." So we have Obama being friendly towards an admitted terrorist bomber who has no regrets for his actions. The acts of terrorism took place decades ago; still, one wonders how the Democrats would feel about a Republican politician who pondered political strategy with Bull Connor of Birmingham police-dog fame, or with Eric Rudolph the abortion-clinic bomber. The fact of the matter is, Barack Obama has a point. It's not fair for him to be asked about his association with known terrorists in the context of a Democratic debate. Hillary tried to take advantage of the question, but Obama pointed out that she was the pot calling the kettle black: her own husband, President Bill Clinton, commuted the sentences of Susan Rosenberg and Linda Sue Evans, both Weather Underground members who had actually succeeded in killing innocent victims! What's more, he pardoned an additional 16 members of the Puerto Rican terrorist group FALN, who set off 120 bombs in New York and Chicago, killing 6 people and maiming more. If anything, the FALN pardons are fruitier: Clinton offered the pardons on condition that they renounced violence, but the killers took the pardons, walked free, and refused to make any such statement! They're still strolling the streets of our fair land to this day. Nor is this affinity for terrorists confined to the current Democratic candidates. 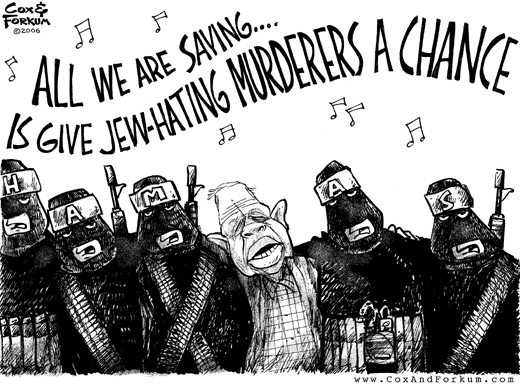 This very week, ex-President Jimmy Carter is over in the Middle East meeting with the terrorist group Hamas! He's bouncing from the West Bank, to Egypt, and then up to Syria (a state supporter of terrorism) to have tea with Khalid Mashaal, Hamas' leader, who has taken responsibility for countless deaths in Hamas-sponsored suicide bombings. The editorial cartoon pretty much sums it all up. It's been said that you can know a man by the company he keeps; their associations with terrorists doesn't speak well for the Democratic candidates. Obama is completely right in saying that the question of associating with terrorists didn't belong at the Democratic debate. There's nothing to debate about: none of the major Democratic candidates have any problem with murderous terrorists, as long as it's Americans or Israelis that they kill. The appropriate time for that question is in the general election debates; let's see what John McCain has to say about these friends of Democrats. After all, he's spent more time in the immediate presence of evil than all the Democrats combined - but unlike them, he knows evil for what it is, and knows there's only one way to deal with evil: fight until your dying breath. A bunch of my co-workers were talking about this after the debate. They considered what Stephanopoulos asked to be "way over the line", horrible in every since of the word. I didn't say anything - I usually don't since it's pointless - but I could keep my mouth from hanging open a few inches. These SAME people - liberals, "progressives", scum, whatever - routinely denegrate any Republican they can for whatever connection can be found, whether it be misconstrued or not. jimmy carter should be hung for treason. wouldn't that fall within the grounds for treason? hamas is an enemy of the state, are they not? I don't think that what he did qualifies as treason, no matter how you stretch it. Hamas can certainly be considered an enemy of America but not Carter did not give aid to them. (Not that we know of, anyway) My guess is that guys like Carter are their own worst enemy. Eventually, he'll wonder into some place he shouldn't have gone, and they'll hang him for us. "Open border" liberals are constantly getting hoisted by their own petard. Ifon has a point, but unfortunately, the "open border" liberals are not getting hoist by their own petard, most of them are rich enough to avoid the consequences of their policies just as the judges who ordered forced busing in the Boston schools lived in the liberal suburbs and were not affected by their actions. Mr. Carter gets secret service bodyguards at our expense, for example. No way he'll ever get mugged; he's safe, so he can talk about brotherhood, tolerance, etc. It's us ordinary citizens whom crime affects, not guys like Carter. Carter? Treason? *Snorts* People are SO ignorant! Something Must be done to stop the killing. Something! People have been rounded up, and put into 'modern' concentration camps. They are restricted as to their movements, food aid has been denied to them, and they have been treated horrendously. People need to wake up, and speak out against about this! The last time there was such atrocities involving those of Jewish decent it was during the holocaust. It was against the Jewish people, not committed by the Jewish people. Undeniably the holocaust was an abomination! And these atrocities against the Palestini people are an equal abomination! Israel needs to NOT do unto other's what HAS been done onto themselves. Palestinians are being killed every day, and nobody seems to notice. Yet, that does NOT give them, nor Hamas * the right to attack, and murder the Israeli people. Both sides are committing crimes against humanity. Both are guilty. A mediator MUST step in, take them both by the hand, and in some way attempt to bring peace to the region! Carter is a true gentleman! A hero! Trying for peace against all odds. I'm proud that he was our president, and prouder still that he has tried to people to agree to stop murdering each other. * Hamas were terrorists, as far as I know. They've said they will stop killing people. Terrorists kill people to cause terror. IF they stop killing people they are not 'terrorists', although I'm not sure what they should be called. Maybe: Ex-terrorists? While they [are] were committed to mindless violence they could not be reasoned with. By stopping the violence while coming to the table to talk about peace, Hamas has shown that might be willing to stop their [previous] murdous actions. IF they agree, long-term to stop murdering people that is a Good Sign! Nobody can disagree with that. Only a few questions remain: Will the Palestinians be able to keep their side of the peace? Will Hamas break their part of agreement? And we also must ask: Will Israel keep their side of these Peace Agreements? It is a question that must be asked of all three parties. Since all are guilty of killing people. You cannot pick, and choose which (if any) side to trust without questioning both about their commitments. Well, last I heard, the rockets from Gaza were still randomly raining down on Israeli houses, hospitals, schools, etc. So the fact that the Israeli army at least attempts to hit only combatants and avoid kids (though not always succeeding), and the Hamas terrorists INTENTIONALLY go after civilians and kids most of the time because they're easier targets, doesn't create any sort of ethical difference between them? At all? I would say that those sort of tactics, used incessantly for the last three decades, have pretty much removed any moral right to their own country that the Palestinians might have once had. Their free and fair election of murderous, monstrous gangsters as a "government" is just the final proof of this.